DOWNLOAD the 504 Parent Handbook! to your COMPUTER for the low price of $7.99! If you are the type of person who prefers to read information rather than reading through web pages, I’ve created the 504 Handbook just for you. 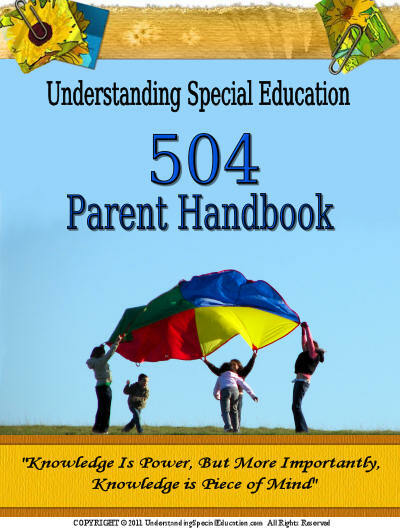 This easy to read e-book helps you provides you with everything you need to know about Section 504 and special education. With so many children being diagnosed with ADD, ADHD and other conditions like childhood anxiety, and depression, it’s so important that parents understand the differences between a 504 plan and an IEP. Your child has been diagnosed with a medical condition like asthma or migraine headaches. Your child has been diagnosed with a psychological disorder like anxiety, obsessive-compulsive disorder, or depression. You feel your child’s classroom teacher can provide modifications to your child in the regular education classroom. What is the difference between special education and 504? How do I use my school’s student study team (SST)? How do I know if my child needs special education services or a 504 Plan? How can I make sure my school is providing my child with an appropriate education? How can I ensure my child is successful in school? The 504 Parent Handbook is securely downloaded directly to your computer. Once you’ve received it, you can print it in its entirety, hole punch it and place it in a three ring binder. You can take the guide with you to 504 to student study team meetings, parent-teacher conferences or you can just have it handy if you need more information on a specific topic. The 504 Parent Handbook provides over 50 pages of information and is offered at $7.99. It is also available on Amazon as a glossy, hard back bound guide for $14.99. I suggest that you CLICK HERE and view the TABLE OF CONTENTS to help you to decide if it would be an asset to you and your family. ATTENTION PARENT GROUPS and SCHOOL DISTRICTS! A discounted rate is offered on bulk orders over 50 copies.